Although I moan that I have horrible oily hair from time to time, I have to admit that I can normally fix this myself with a spray of my lovely dry shampoo. The problem I face on a daily basis with my hair is dry and frizzy ends. After about 4 years of Ombré hair, all the bleach and hair dye has finally caught up with me and has now left my hair in a horrible brittle and dry state. 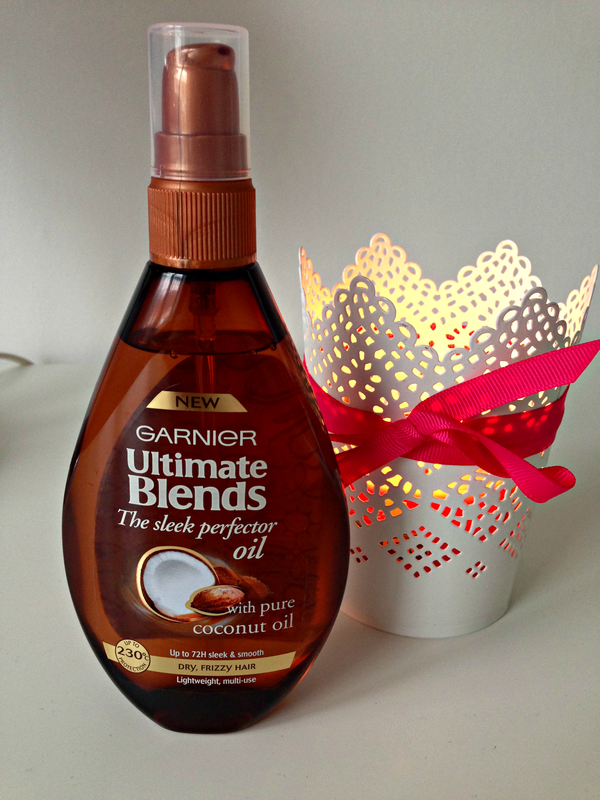 I've tried a few different serums and oils before with varied results but after reading a few reviews on Bloglovin for the new Garnier Ultimate Blends Sleek Perfector Oil, I thought I would pick me up a bottle on my next shopping trip to see what all the fuss is about. I've tried the Garnier Ultimate Blends shampoo and conditioner before and really loved the smell of them, so I knew a little bit of what to expect. I know when I use a new serum or oil for my hair, my main concerns are will it weigh down my hair? Will it make my hair go greasy? And amazingly enough, this product did neither. The formula is really light and dries into the hair quite nicely and even when my hair had dried there was no evidence of nasty oil residue! I've been using this oil for a few weeks now, normally applying to wet hair after my shower on a night, and I have to say that I have noticed a massive difference to my hair. I no longer have to sit and have a battle with knots every single time I brush my hair. I've even noticed that sometimes I will daydream throughout the day and stroke my hair because it's just so smooth and silky. Weird? I have to say that the price tag for me is a little steep but if you're only applying a few pumps of oil every time, a 150ml bottle will last you for quite a long time. Great review! My hair can get super frizzy sometimes so I'll definitely check this out! Thank you for sharing. I love this product, it tames all of the fly aways, thans for this amazing review!